This lung disease causes the airways to tighten up during an attack. When you are breathing air at depth, that air assumes the pressure of the surrounding water, so it is higher the deeper you go. If this air were to become trapped as the airways constrict during an asthma attack, it will expand as you ascend to the surface and cause lung damage. The diagnosis of asthma falls into a broad area, ranging from the person that wheezes after a light jog, to someone who had it in childhood, but still carries the diagnosis into a trouble free adulthood. A well controlled asthmatic has as much risk of lung problems underwater as a smoker, so it is possible for many to dive. If your dive doctor feels your lungs are fine after testing them with a lung function test called spirometry then you may be fine to dive after all. During training a diver will learn all about the bends or decompression sickness [DCS]. Nitrogen, absorbed at depth, comes out of the tissues too quickly and forms bubbles. These can go anywhere in the body and cause a broad range of symptoms related to where in the body they are. The most important thing a diver can remember is that the bends does not only occur if they have a rapid ascent from a dive. There are many factors than can increase nitrogen loading or decrease off-gassing at the end of a dive. Increased exertion, dehydration, a saw-tooth profile dive and menstruation are a few of the factors. So even if the diver has stayed to their tables, it is possible to still get bent. As a rough guide, diving doctors say that any symptom occurring within a day or two of a dive must first be assumed to be a bend before anything else. This includes tiredness, tingling, numbness, dizziness as well as the more obvious joint pain and paralysis. The sooner a diver is treated the better the outcome. It is possible to get a bend in the skin as well. A red marbled, mottled rash appears across the chest and back. This responds well to oxygen breathed at the surface but may need chamber treatment too. These can be worn while diving, however, getting a prescription lens for your mask is probably better. The reason is that in the water lurks a unicellular microbe called “acanthamoeba”. If this gets into contact with a scratched cornea, the outer layer of the eye, then a rapid blinding infection can occur. The chance of this is increased in lens wearers, but it is rare. So if you do dive with lenses under your mask, see an eye doctor quickly if you get a painful red eye after a dive. Diabetics are allowed to dive, but will have to have an annual medical check with a specialized dive doctor who will check that sugar control has been good over the previous year, as well as looking at general health. If there concerns that the diver is at risk of getting low blood sugar (hypoglycaemia) in the water then they will be barred from diving. A diabetic diver has to check their blood sugar before and after every dive and it is crucial that the diabetic stays well hydrated, especially in hot climates. They should inform the diver in charge of their condition in case of later emergencies. We are all taught the importance of equalizing the sinuses and the middle ear. A simple Valsalva movement, like stopping a sneeze half way through, will do this. Not doing so may lead to a middle ear infection which will stop air from entering this area, and equalizing becomes impossible. If you dive like this, the remaining air would contract and damage the ear drum and windows into the inner ear where the balance centres are and that could result in a permanent ringing and even deafness.If you suspect you have an ear infection, get your doctor to have a look in the ear, ad start antibiotics if needed, but stay away from diving until it is fully better. Epilepsy, whether petit mal, grand mal or any other of the varieties that can occur, it is absolutely forbidden for anyone who wants to dive and there are no exceptions. The reason is obvious, as a fit underwater will be fatal and not just endanger your life but also your buddies as well. In addition, anti-epileptic medication can bring on narcosis at a very shallow depth too and is banned for a diver. But there may be hope there on the horizon. If an epileptic stays fit free and off medication for 5 years it is deemed that they are a low enough risk of another fit and are then allowed to learn to dive. As to when to come off the medication is a decision only the neurologist can make. A diver who collapses unconscious within minutes after a dive, or is found floating unresponsive on the surface after a dive, is most likely to have had a gas embolism. This is where gas bubbles enter the arterial circulation and travel to any part of the body causing symptoms. If they enter the brain, symptoms of stroke going on to death can occur. The best medical support in these situations, if the patient is non-responsive with no pulse or breathing, is to do CPR, 2 breaths to 15 chest pushes, and call the Emergency Services. Recompression in a chamber is the only treatment. Another cause, highlighted more recently for bubbles in the arterial circulation, is a Patent Foramen Ovale (PFO). This is a hole in the heart between the 2 atria. Nitrogen bubbles returning to the heart via the venous circulation that would normally end up in the lungs and get exhaled, instead are shunted across this hole. They then enter the left side of the heart and are carried off to all parts of the body. Many symptoms can result but classically a skin rash or bends at shallow depths are seen often. PFO's are diagnosed easily and can be closed by a heart surgeon. The higher your blood pressure the more risk there is of heart attack and stroke. This would be potentially fatal underwater, so there are rules that govern diving and blood pressure. If your BP exceeds 160/100 then you are barred from diving. bear in mind that a lot of readings can be artificially high when you are rushing, even seeing your GP is enough to raise it, so called “white coat hypertension”. So make sure several readings are taken before you are landed with this diagnosis. If it is high then weight loss, exercise and medication can reduce the pressure and allow you to dive after all. A diver must never try to do what they are not trained to do. Inexperience can lead to panic, resulting in injury or death if the dive goes wrong. Cave and wreck penetration, deep depths, strong currents and hazardous geography can all bring on the unexpected if you do not have enough dives or training under your belt. If the dive you have booked turns out to be something unexpected and you feel apprehensive about doing it, then do not do it. Diving is not a competition, so do not feel embarrassed about pulling out of a dive. These invertebrate creatures can be the bane of a diver's life and the best thing is to do is prevent yourself from being stung. Wearing a full wetsuit or a lycra suit will stop a jelly from stinging you, but only on the non exposed parts of your body. Jellyfish feed by enveloping their prey in their tentacles and paralysing them with "nematocysts". These are tiny bags full of venom that are found on the tentacles, and on contact with a fish or human skin they fire off, releasing the poison into whatever they are in contact with. Get out of the water as soon as you can and have someone help get any tentacles off your skin. They must stop any remaining nematocysts from firing off and the best thing for this is ordinary household vinegar. Pour this over the area affected and on any remaining tentacles. If there is no vinegar handy then there are other fluids you can use, the best of which is urine, which may seem bizarre but has good medical grounding due to its relative warmth and acidity. Having been doused in whatever liquid, try to take off any remaining tentacles with gloved hands so you don't get stings on your fingers. Take a simple analgesic such as ibuprofen and apply some calamine lotion on the affected area twice a day too. Children are allowed to dive as young as 8 now. There is a debate on whether kids this young shuold take on a sport that can have serious medical consequences. On one side is the argument that with good training and easy, shallow dive profiles, a child can get as much enjoyment as anyone from the underwater environment. On the other side, is that a diver and their buddy should be able to help each other in an emergency. There are great physical and emotive differences in a young teenager compared to an adult, and difficulties could put both parties at risk. It really is up to the parent and the child to approach diving with a realistic attitude as to the child's abilities to respond to emergencies that may include having to give life support to an adult. A case in Egypt highlighted the need for good insurance. A diver suffered a severe case of the bends following a dive over 40 metres. The insurance company refused to pay for the consequent recompression, as the diver was only insured to dive to up to 30 metres depth. We all know insurance has small print, and we rarely read it before signing but it is best to do so when diving is concerned as the bills can be huge. A helicopter evacuation to a chamber from a remote island, along with the recompression can come to over $ ½ million dollars. Make sure you are covered for the dive profiles you are doing. Most insurance from normal companies will only cover a diver down to 30 metres, irrespective of what level they are at. Compare this to the fact that many divers are qualified to 40 or 50 metres, you can see the discrepancy. It is better to go with specialist dive insurance companies who offer realistic depths insured for divers, as well as having helplines staffed by dive doctors. They can be found in most dive magazines. If you are diving in a malarious area, then it is mandatory that anti-malarial medication is taken. Most curent drugs are fine to take if you are diving, however there can be problems with mefloquine, or Lariam, as it is otherwise known. This can cause psychological side effects, such as panic and anxiety and it is not recommended for divers. Because of resistance to these medications across the world, Lariam may be the only drug of choice in particular parts of the world, so plan your dive trip with this in mind. Chloroquine/Paludrine and Doxycycline have to be taken a week before entering a malaria area and for 4 weeks afterwards, which can be a problem if your trip is only a few days long. So malarone, the newest of the prophylaxis which is taken 2 days before and a week after seems to suit divers best. It has revolutionized diving but can cause problems for some divers. Rashes and allergies as well as chafing can result from the close contact of neoprene. Allergy is easy to spot as there will be a generalized rash in the area of the wetsuit. This will be noticed within minutes of surfacing, but should not be confused with a skin bend which is more marbled and blotchy, and occurs in the upper body. Treat the allergy with oral anti-histamines and calamine lotion. For chafing which classically occurs around the neck, knees and elbows, try Vaseline before putting on the suit. A mild steroid cream e.g. hydrocortisone 1% used 2-3 times a day is the best treatment afterwards. A divers cure, and a deep divers curse. If a diver surfaces with any problem, from a potential bend to collapse, it is best to administer oxygen immediately. This can be by letting it free flow over someone's face who is breathing, or blowing it into the lungs during CPR if the correct equipment is available. Death is always a result of hypoxia, low oxygen. It is the most important gas for a diver at the surface. It can also be used to cure simple mild bends, such as skin DCS. Often 2 to 3 hours on 100% oxygen will be enough to reduce the need to go to a chamber, but only let a doctor make this decision. But oxygen has its downside. The reason mixed gas divers have to use gases made of lower concentrations of oxygen at great depths is due to oxygen toxicity. This is where oxygen at high concentrations, due to greater partial pressures at depth causes fitting and death. It is inadvisable to dive if you are pregnant. We all dive, and usually without problems, as this is a decision concerns ourselves only, but the question with pregnancy is what could happen to the unborn child if a problemoccurs. Nitrogen bubbles are easily absorbed by neuronal or nerve tissue. If a pregnant diver got a hit but it stayed undiagnosed, as it does often, then the foetus could easily have a neurological DCS and you wouldn't be aware of it. This could cause problems later in the unborn child as the nervous system developed in pregnancy. Of course there are a lot of women who have dived whilst not realising they were pregnant and without any problems, but the key issue is that if you dived, had a bend and there was a deformity in your child when born, it would always raise the question of was it due to the nitrogen and could it have been avoided. Too much guilt to bear for any parent. Just leave it for 9 months, it ‘s not that hard when the downside could be disastrous. The most common complaint heard on a dive boat is that of sea sickness. The rocking of the boat confuses the balance centres in the inner ear. Signals are sent to the brain, and nausea with vomiting result. When traveling in the boat always be in a position where you can see the waves and swell, so as to anticipate which way you will move. This feeds back to the brain and it compensates for the movement. If you still get seasick despite this, then there are simple drugs you can take, but they must not make you drowsy. One of the best is prochlorperazine. It is prescription only though. Other over the counter medications can be effective too, but take a test dose before you dive to see if it makes you drowsy or not. And if you are going to be sick on a boat, remember the golden rule. Aim downwind. A reverse block is the opposite not equalizing properly. On ascent, the air in the middl eeara nd sinuses expands as pressure decreases towards the surface. If the air cannot get out , a reverse block will result. The middle ear will expand, pressure will increase across the ear drum and perforate it. Reverse blocks most commonly occurs in divers who have used decongestant drugs to help equalize in the first place. The drugs wear off and the Eustachian tube congests and stops air exiting the middle ear. If you do use these medications, make sure the dose is sufficient to last the day or at least the dive. It's the most common myth in diving. Sharks like blood. Menstruation involves blood. Ergo sharks go for menstruating divers. This is false and there have been no recorded cases of this as a cause of an attack ever. Good dental hygiene and structure is imperative. If a crack in the tooth allows air into the central part of the tooth, then mucous or a mouthpiece can block its exit. The increased pressure on ascent can blow a tooth to bits, with all the consequent pain. Likewise unstable teeth or mobile plates can get dislodged and inhaled underwater. Poor gum hygiene can be worsened and lead to infection by having to bite on a mouthpiece for 3 hours a day on a busy dive holiday. Make sure you have an annual visit for a dental check up and make sure any bridge or crown work is done at least a month before diving. This is the most common marine animal to assault a diver. Through no fault of its own, urchins inhabit shallows and rocks where a diver might be making a shore entry. Spines can penetrate the thickest dive boot. Once the spines enter the flesh, they break off and always leave the tips embedded. There are many local cures for urchin spines from grabbing a hot rock and slamming it onto the ground to break down the spine tips, to hot wax poured over the area, and peeling it off hoping all the bits come with it. But there is only one real way of removing them. That is local anaesthetic and fine forceps with steady medical hand doing the job. The dangers of poor removal are local infection. If not treated with antibiotics quickly, this can spread to the whole body. It's best not to get pronged in the first place. So if your buoyancy is still at the novice level, stay well away from the rocks, and when you are wading into the sea on a shore entry, take a moment to put your head under the water to make sure your route is clear. There is no vaccination that will prevent a diver from diving. Whether it is Hepatitis A, typhoid, rabies, tetanus or all the myriad of others needed for certain areas at certain times, all are safe for the diver. It is best you check your requirements with plenty of time before your planned trip. Some vaccines, like Rabies and Hepatitis B are 3 shot courses, and take a month at least to give before going away. Some countries need proof that you have immunity to certain diseases before allowing you in. Yellow Fever is the classic example, especially entry to a country when you have come from an area where it is prevalent. The easiest way to find out all your needs is to go online. Many sites offer free up to the minute advice on which shots for which parts of the world. This is often better than asking your family doctor, who uses older data published in magazines. 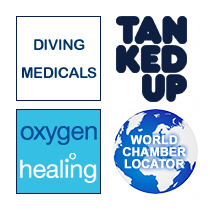 The internet has revolutionized diving medicine. Where before a diver had to travel hours to see a doctor specializing in dive medicine, or make expensive phone calls to insurance help lines staffed by people with little dive experience now you can get immediate advice from those who know all about diving medical issues. Experience shows that most diving medical questions are relatively easy to communicate to a doctor, and are simple to reply to. They may end up with advice to see a doctor face to face, but at least you know your trip to one will not be in vain if you get a quick opinion online before going. There are some differences with the female diver as compared to the male. Current research is focusing on the fact that there is a tendency for women to get DCS more often during their periods, or at the time just before. No reason has been given as yet, but err on the side of caution if you are diving at this time. Do not dive if you are pregnant and periods can be delayed whilst away. It is alright to dive after breast enlargement, as long as the prostheses are made of silicone or water filled. Breast feeding is OK for the female diver, but make sure there is not too much pressure across the chest when the BCD inflates as this could leave your child hungry when you get back. Go for the more open fronted BCD's commonly used in female diver photo shoots. Dive tables and computer algorithms that tell you how long it is safe to stay at depth for are only a guide. You can still get DCS diving within these strict definitions. The most common reason to fall out of tables is due to your physiology at the time. Like any sport, diving is the same. You have to make sure you are fit and able enough to do what you want to do. Lack of physical fitness will make every dive more tiring. This will increase your on-gassing, and thus your nitrogen load. And the chances of you getting a bend. So before you go on any long dive holiday, go to the gym first. Hydration is equally important, and your bodies' fluids can be decreased by not drinking enough in a hot climate, or with diarrohoea. A 10% loss of fluid can increase your chances of a bend many fold. Always make sure you are hydrated enough to be passing clear urine. Coffee and alcohol will cause dehydration. Never drink alcohol just before a dive and make sure you are rehydrated after a boozy night before. Other recreational drugs e.g cannabis, ectasy or amphetamines are totally banned whilst diving. This family of underwater nasties is the general term for anything that seems to sting you that you can't see. From hydroids, fern like creatures that leave an angry painful rash for weeks on exposed parts of your body, to fire coral, at least the cures are the same. Once "stung" it is best to treat the pain and prevent infection. Local anaesthetic spray can work in the short term, but oral painkillers like ibuprofen and codeine will do. Get some steroid/antibiotic cream and use it 2 to 3 times a day as well. The pain will turn to itching in a few days, but the rash can last for weeks. It is best to avoid contact in the first place, so always stay a few feet from rocks and coral when you dive. Corals can also cause cuts. The tropical climate where they exist can also delay healing out of the water. Watch out for infection in these wounds and keep them as dry as you can. Plastic skin sprays are good if you need to dive on and are cut.